Casey Crawford hosts several other local businesses in her unique take on the general store, Park City Mercantile. "I’ve always had a love for clean, modern design,” says Casey Crawford, owner of Park City Mercantile (523 Main St, 435.631.0925). Crawford’s monochromatic-hued fresh take on the traditional general store packs a mighty punch, stocking a carefully selected collection spanning cozy wool blankets and coconut-milk bath soak to granola and Stanley thermoses—many of which are made by beloved local brands, including Ritual Chocolate, Queen Farina Honey, Porter Ceramic Goods, and Allgood Provisions. Said items are neatly arranged atop open wood shelves set against white walls, a concrete floor, and an eclectic soundtrack of Ibiza house music, acoustic Eddie Vedder, and old country classics from Waylon Jennings and Willie Nelson. “We love brands that tell a story, and are always seeking out great local products that fit our aesthetic,” says Crawford. 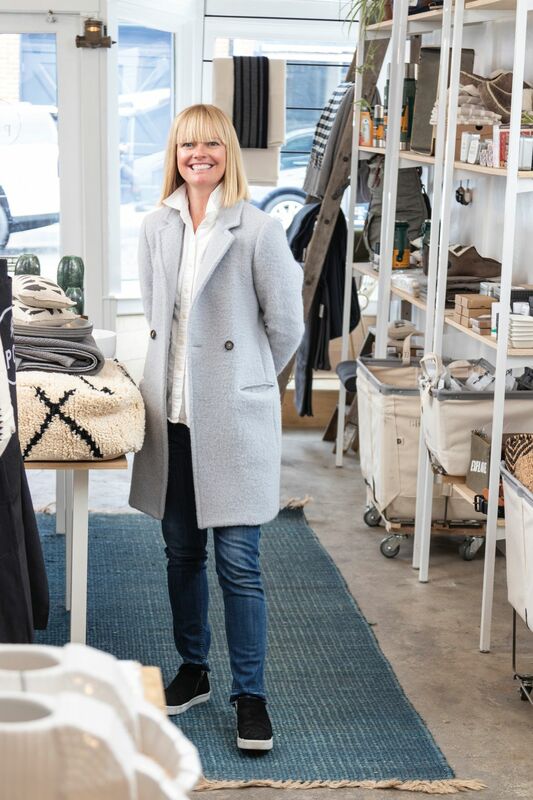 But rather than simply selling Utah-made items, Crawford has taken her love for all things local one big step further by inviting Park City business owners to set up shop inside her own—like a permanent version of a pop-up shop. Luxury home décor and . recently opened a showroom in the back of Park City Mercantile, while beauty bar Rose + Water is perched above the shop on the building’s second floor. “I love synergy, and when different concepts come together and it ‘just works,’ you’re creating something unique,” explains Crawford. Park City Mercantile isn’t her only cooperative retail rodeo, however. At Crawford’s debut Main Street boutique, Prospect (509 Main St, 435.655.3250)—purveyor of clothing, shoes, and accessories for men, women, and kids—a similar scenario plays out: Billy’s Barber Shop is tucked in back of the store, and Pink Elephant Coffee resides in a loft-like space on the store’s second level. (Read more about the collective here). Crawford says that providing her customers one-stop variety is just one part of the equation—her intent is also about giving fellow entrepreneurs a chance to thrive in an increasingly expensive town by offering an address in a primo location. “I want to keep Main Street unique, and by creating these collective spaces, we give just that to visitors and locals alike,” she says. We’ll shop to that.